A few weeks ago I wrote about a constant weighted index (CWI) of the monthly Purchasing Managers survey. Presented by economist Rolando Pelaez in a 2003 paper, the CWI assigned various fixed weights to the separate components of the survey. The Purchasing Managers Index, or PMI, covers manufacturing industries, now a relatively small part of economy. In the past thirty years, our economy has become dominated by service industries which are surveyed separately each month. 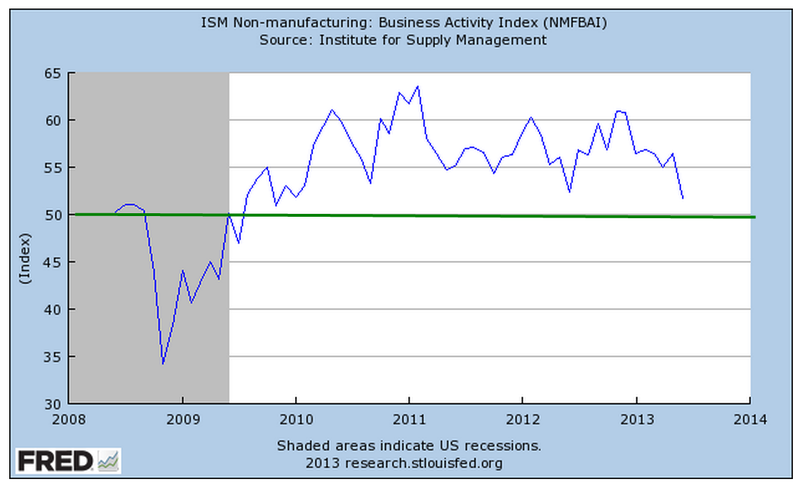 The composite of the non-manufacturing survey is the Business Activity Index, or BAI. Two weeks ago, June surveys for both sectors indicated a very slight expansion. The service sector edged up but is hardly robust. Wanting to see what a composite Manufacturing, Non-Manufacturing index would look using Mr. Pelaez methodology, I combined the components of each survey, assigning 70% to the service sector and 30% to the manufacturing sector. Did I get out my R statistics program and run multiple regressions to find the combination of percentages that fit the historical data best? No. While the manufacturing sector is less than 20% of the economy, it has powerful influences on the service industries in a community. How much effect? Using my gut, I came up with 30%. The results surprised me. The graph below starts in 1997 and includes the latest June figures. It compares this composite index, labelled M+NM (manufacturing and non-manufacturing), with the service sector BAI and the SP500 stock market index. The composite index loosely follows the BAI, which is an easily available index that an investor can find by typing in “Fred Business Activity Index” into Dr. Google. The chart shows a divergence between the recent rise in the stock market and the recent decline in business activity. Let’s take away the clutter and look at the BAI itself. Growth has slowed but this may just be a normal dip in the business cycle – nothing to be alarmed about. For the past month the stock market has been trading on whether the Fed, and China, can keep holding up the world’s economy. Corporate earnings this past quarter are expected to show lackluster growth, economic activity indexes are showing a somewhat lackluster expansion – and the stock market makes new highs.